太极拳晨练，免费早茶 Practice Tai Chi、Early Bird Coffee and Tea. 船过西陵峡东段、中途用自助早餐。East section of Xiling Gorge、Breakfast (Buffet). ?？咳咳思揖扒胪罚ㄗ杂苫疃奔洳坏陀?小时，游船为保障游客安全，未参加该自费景点的游客只能在船上自由活动）Shore excursion to Tribe of Three gorges (optional). 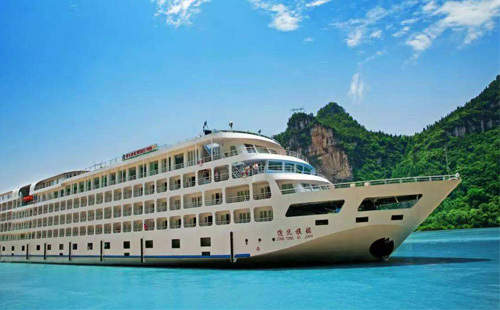 上岸游览【三峡大坝】欣赏高峡出平湖的壮丽景色 Stop at Sandouping Dock，shore excursion to the Three Gorges Dam. 通过三峡大坝五级船闸，欣赏游船如何穿过五级船闸 Pass through the ship locks of the Three Gorges Dam. 太极拳晨练，免费早茶 Practice Tai Chi、Early Bird Coffee and Tea. 上岸游览【神农溪】奇妙的峡谷、原始的自然风光 Shore excursion to Shennong Stream by small boat. ?？糠罱诎椎鄢锹胪罚ㄗ杂苫疃奔洳坏陀?小时，游船为保障游客安全，未参加该自费景点的游客只能在船上自由活动）Shore excursion to White Emperor City(optional). 太极拳晨练，免费早茶 Practice Tai Chi、Early Bird Coffee and Tea. 上岸游览【石宝寨】奇妙江中盆景、三峡著名的建筑艺术奇观 Shore excursion to Shibaozhai Temple..
重庆朝天门港下船，结束长江三峡总统游轮之旅 Landing at Chongqing-The Three Groges trip ends.